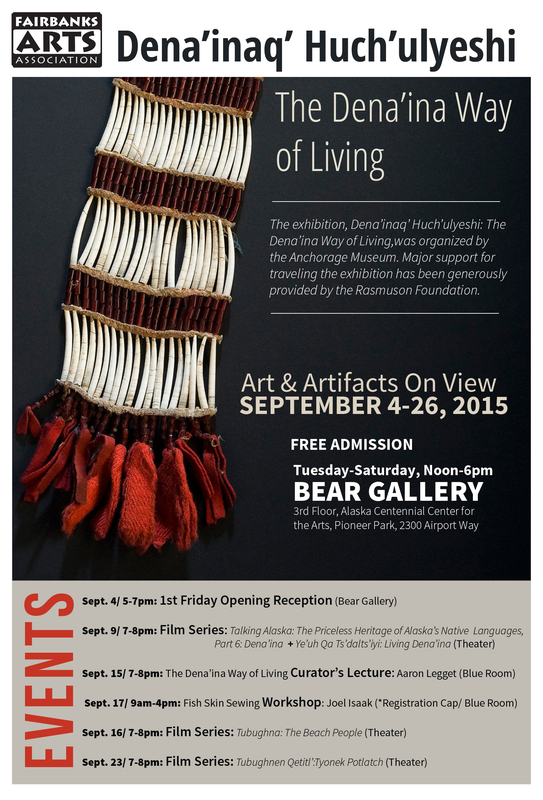 Organized by the Anchorage Museum, the exhibit Dena’inaq’ Huch’ulyeshi: The Dena’ina Way of Living is coming to Fairbanks Arts Association’s Bear Gallery for September 2015 thanks to generous support provided by the Rasmuson Foundation. About half of Alaska’s residents live in traditional Dena’ina territory but have little knowledge about the indigenous people who have called South-Central Alaska home for centuries. The Anchorage Museum changed that with the first major exhibition ever presented about the Dena’ina Athabascan people. This exhibit demonstrates that, although Dena’ina have experienced life-altering changes during the past 200 years, many core values and traditions survive. Dena’inaq’ Huch’ulyeshi: The Dena’ina Way of Living, will be on view at the Fairbanks Association’s Bear Gallery from September 4 through 26, 2015. The gallery is located on the 3rd Floor of the Alaska Centennial Center for the Arts, Pioneer Park, 2300 Airport Way. Gallery hours are from Noon to 6pm, Tuesday through Saturday. There is no admission charge to enter the gallery. The exhibition is comprised of Dena’ina art and artifacts on view in the Bear Gallery as well as a film series, lecture and workshop held in the Pioneer Park Theater and Blue Room in the Alaska Centennial Center for the Arts. An Alaska Native art specialist, Jones served as the Anchorage Museum’s deputy director from 1997-2015. Prior to this, she worked for the National Endowment for the Humanities and the Alaska State Council on the Arts. Jones has more than 30 years’ experience curating museum exhibitions, managing international loans, producing exhibition catalogs, and developing Alaska Native art and culture programs. Jones also has conducted field research for the Smithsonian Institution and the Library of Congress. She earned her doctorate from the University of Oregon. Fall is an expert on Dena’ina social organization and leadership patterns. As an anthropologist he has worked with Dena’ina people for more than 30 years, and he has taught Dena’ina-related courses at the University of Alaska Anchorage. Fall is co-author of “Shem Pete’s Alaska: The Territory of the Upper Cook Inlet Dena’ina” and author of “The Upper Inlet Tanaina: Patterns of Leadership Among an Alaskan Athabaskan People, 1741-1918.” He earned his doctorate in anthropology from the University of Wisconsin-Madison. Prior to joining the Anchorage Museum in 2011, Leggett was the Dena’ina cultural historian at the Alaska Native Heritage Center. He is the co-author of “Dena’ina Heritage and Representation in Anchorage, AK” and “Nat’uh: Our Special Place.” He has served as treasurer for the Native village of Eklutna since 2007. He earned his bachelor’s degree in anthropology from the University of Alaska Anchorage.